2012 Suzuki DR-Z400SM Is Here! The 2012 model of Suzuki's exhilarating Super Motard, the DR-Z400SM has arrived in Australia, featuring a dramatic new colour scheme. 2011 Suzuki DR-Z400SM Is Here! The 2011 model of Suzuki's exciting Super Motard, the DR-Z400SM has arrived in Australia. A dual purpose machine built for the streets, the DR-Z400SM is a proven performer and is ideal for fun on the weekend or the daily commute. The new look 2010 model of Suzuki's exhilarating Super Motard DR-Z400SM has landed in Australia. Due to its continued success, Suzuki Australia has announced an extension to its hugely popular DR-Z Bonus Bucks campaign. Available for a limited time, Suzuki Australia has announced an exciting $500 Customer Retail Bonus Campaign for new road-registerable DR-Z models. Introducing a revolutionary new motorcycle, Suzuki Australia has released its first-ever production supermotard machine - the exciting new four-stroke DR-Z400SM. 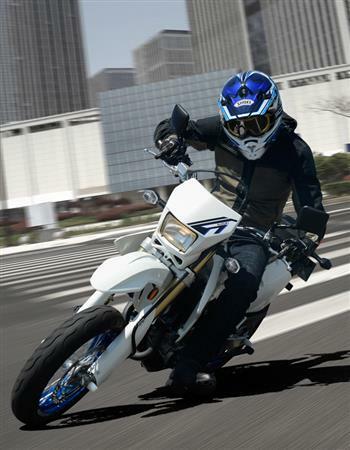 Suzuki Australia has released advance details of its exciting new 2006-model DR-Z400SM supermotard due to arrive in Australia later this year. For MY19 Suzuki's popular super motard, the DR-Z400SM will be available in two striking new colour schemes.